On October 22, the Department of the Interior released the findings of its independent investigation of the Gold King Mine blowout on August 5. The Bureau of Reclamation (BOR) led the technical evaluation and coordinated with the Army Corps of Engineers and US Geological Survey for peer review of the work performed by the bureau. The evaluation team included six engineers, four of them licensed professional engineers. The findings revealed that the blowout could have been prevented with the proper engineering expertise. However, federal standards of practice for reopening and remediating flooded inactive and abandoned mines are inconsistent from one agency to another. Various guidelines exist for this type of work, but there is little in actual written requirements that government agencies must follow when reopening an abandoned mine. Furthermore, mine guidelines and manuals provide detailed guidance on environmental sampling, waste characterization, and water treatment, with little appreciation for the engineering complexity of some abandoned mine projects that often require, but do not receive, a significant level of expertise. 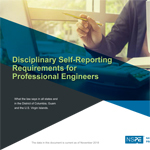 NSPE has long urged the Environmental Protection Agency and all federal agencies to require a licensed PE, with the necessary education, experience and qualifications, to perform all work that is the practice of engineering. This report, written by an agency of the federal government, makes the strongest case possible for requiring this practice across the federal government. NSPE will be working closely with Congress and federal agencies to institute this long overdue requirement.